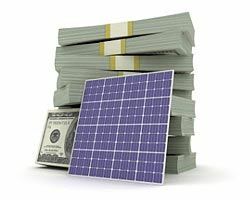 Once upon a time five directors at a French bank named Societe Generale decided that they would form a corporation to cash in on the solar energy programs being pushed by the Obama administration. They got together with a few of their Wall Street buddies, came up with a scheme and looked for a market. Of course, few of these solar schemes have worked as advertised and none have worked without huge infusions of taxpayers' money. In March 2013, seven BSG executives were charged on suspicions of involvement in a scheme to circumvent New Jersey’s so called pay-to-play laws. Prosecutors allege that the executives routinely made – or asked employees to make- illegally reimbursed donations to secure public contracts. By bundling multiple personal political contributions worth less than $300 (which by NJ law do not have to be disclosed) the scheme avoided disqualification under state laws that prohibit public contracts being awarded to firms that have made corporate political contributions to the campaigns of public officials responsible for granting those contracts. On March 26, 2013, a court order authorized the state Attorney General’s office to freeze Birdsall’s assets, then valued at $41.6 million, prompting the firm to file for Chapter 11 bankruptcy protection. The following month, Birdsall Services Group agreed to pay $2.6 million to settle a civil forfeiture action brought by the attorney general’s office so it could access its bank accounts and pay employees who had temporarily been furloughed. On June 13, the firm pled guilty and was ordered to pay an additional $1m in penalties, fines and institutions. Edwin Stier, who was appointed by a federal bankruptcy judge in April to lead the company, said that “This guilty plea is an acknowledgement on behalf of (Birdsall) of the serious wrongdoing that occurred and accepts the consequences of those actions while still protecting the interests of the innocent employees, clients and creditors”. Individual cases against the seven executives are pending. How did a crew like this sell Sussex County on a solar deal?